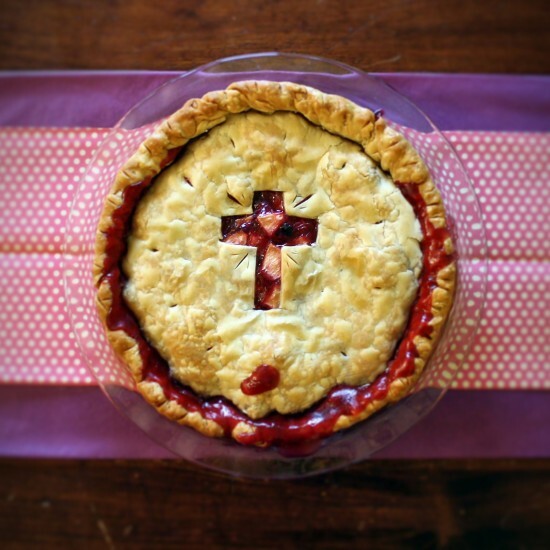 I created this pie last summer for the 4th of July and now that the weather’s warmer, when I think fruit pies are the best, I figured it’d make a good Easter pie, too! This time, I took photos of the process so I could share the recipe with you guys (click through the slideshow at the bottom of this post!). Hope you enjoy it if you give it a try! In a large saucepan, whisk sugar, cornstarch, salt, water, and cinnamon until smooth. Add blueberries. Bring to a boil, cook and stir for 2 minutes or until thickened. Cool slightly. Gently fold apples, strawberries, blackberries, raspberries, and lemon juice into blueberry mixture. Add filling to pie and dot with butter. Cover with decorative crust. Bake at 400° for 10 minutes. Reduce heat to 350° and bake an additional 45-50 minutes.